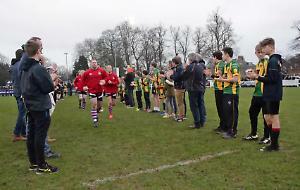 VISITORS Henley Hawks Women ran out winners in the opening Championship match of the season away at newly promoted local rivals Abbey Ladies on Sunday. This is the first time the two sides had met in a keenly contested local derby. The Hawks had all the possession early on and were making good ground. They were attacking into the Abbey 22 and good defence from the home side forced the Hawks to spill the ball. Quick reactions from Abbey centre Alice Denton saw her run the length of the pitch to score in the corner to put the hosts 5-0 ahead. The restart saw similar play with the Hawks having all the ball but they could not find a way through the strong Abbey defence. Mistakes from both sides saw some yo-yo rugby as the first half ended with the home side in the lead. The start of the second half saw Henley change their game plan as they decided to keep it tight as they were winning the battle upfront. Inch by inch the Hawks fought their way up the pitch and all that was left was for Matthews to use her strength, pick and go and reach for the line. Hearn converted and the Hawks were 7-5 in the lead. With 20 minutes of the match remaining neither side were giving up but it was the Hawks that found themselves with the majority of possession and with the new game plan working for them they were building back up the park. The Hawks worked the ball down the blind side into the hands of young debutante Sophie Hill to step the winger and the fullback to score the final try of the match.